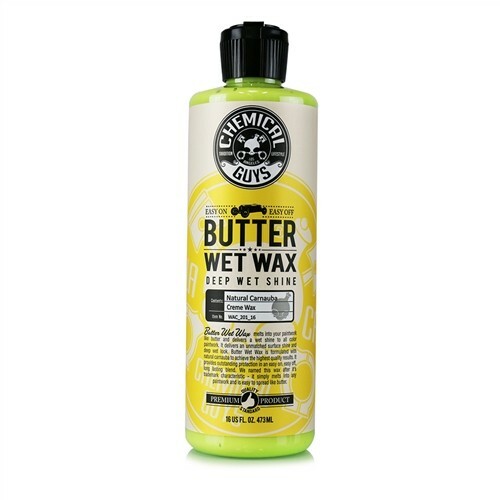 You asked for a Better Butter Wet Wax and Chemical Guys has delivered. Chemical Guys Vintage Butter Wet Wax is an all new and improved formula that delivers an unmatched surface shine and deep wet look. Vintage Butter Wet Wax goes on easier, shines brighter and lasts longer than previous generations. This improved blend of natural Carnauba, polymers, and resins leaves your car shining as if it were just washed! Chemical Guys Vintage Butter Wet Wax enables you to attain the deep gloss of a paste wax in an easy on, easy off, long lasting blend. Vintage Butter Wet Wax is now even easier to use giving that amazing shine only our ultra refined, 100% carnauba based wax can provide. We named this wax after its trademark characteristic; it simply melts into any paintwork like butter. Chemical Guys Vintage Butter Wet Wax is simply stunning. Professionals and enthusiasts alike all around the world choose Chemical Guys Vintage Butter Wet Wax for its easy-to-use capabilities, extremely durable protection, and show winning shine that will look astonishing on most non-textured surfaces including, painted wheels, chrome bumpers, glasswork/ windshields and stainless steel exhaust tips. Chemical Guys uses our all new signature, ultra-refined, carnauba formula creating a wax that utilizes the natural cleaning powers of carnauba to gently cleanse the paint, exposing the natural beauty of your vehicle’s color, while also providing a protective coating that will fight out the harsh effects of the elements. The smooth, protective layer is 100% natural to fight off water spots, bird droppings and road tar. The new improved formula of Vintage Butter Wet Wax is even more guarded against the suns harmful UVA and UVB rays. Your vehicle needs the best protection to fight off the harmful effects of driving. When you desire a deep wet shine with amazing protection, the easy on, easy off Vintage Butter Wet Wax will bring your vehicle’s paintwork to life. Vintage Butter Wet Wax is the world’s easiest wax to use and now it’s even better with an all new improved formula. Vintage Butter Wet Wax can be applied by hand or machine and can also be applied in direct sunlight. Chemical Guys Vintage Butter Wet Wax works brilliantly with all types of paint (Metallic, solid color, Ceramic & Clear coated). Since it’s easy on easy off, it shortens work time and produces a streak/resin free shine in a matter of minutes! Vintage Butter Wet Wax can even be applied while the paintwork is wet directly after a wash. These amazing easy-to-use characteristics make waxing your car fun again! Chemical Guys Vintage Butter Wet Wax will make you realize how quickly your car can have that fresh-waxed look that stands out from the crowd. Vintage Butter Wet Wax is so easy to use, it turns waxing a car into a quick 5-minute job. Chemical Guys Vintage Butter Wet Wax simply melts into any color paintwork revealing a finish so deep you will want to dive right in with the astonishing color. Vintage Butter Wet Wax reveals the amazing natural beauty of you vehicle’s paintwork. Blue paintwork appears deep as the ocean. Red appears vibrant like fire, and white shines pure like fresh snow when protected with a coat of Vintage Butter Wet Wax. Chemical Guys Vintage Butter Wet Wax works amazing on solid and metallic colored paintwork as well as most non-textured surfaces to make your paint shine with the vibrant magic of natural carnauba. Stand out from the crowd, and let your car be star of the show. Your vehicle says so much about your personality, so tell the world you’re a shining star in a fresh-waxed car. Chemical Guys new and improved signature carnauba formula utilizes advanced refining techniques to bring out the natural cleaning properties of the carnauba wax. The ultra refining process allows the natural carnauba cleaning powers to remove light scuffs, bird droppings, road tar, tree sap, and even overspray. Chemical Guys Vintage Butter Wet Wax contains no harsh chemicals or solvents because it only contains 100% carnauba based wax making it safe to use on any paintwork or non-textured surfaces. The naturally durable characteristic of carnauba wax provides astonishing protection from UV solar rays. The new and improved formula is even more powerful at fighting the sun’s harmful UVA & UVB rays. The sun is one of the most harmful enemies of your vehicles paintwork causing fading, cracking, and clear coat failure. With Chemical Guys Vintage Butter Wet Wax you are highly protected while looking simply stunning. Vintage Butter Wet Wax is also available in gallon size.